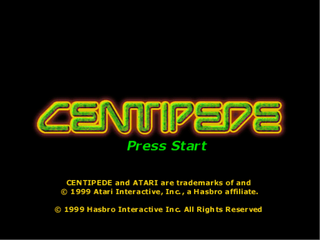 Centipede for the Sega Dreamcast is an update to the original 1980 arcade game Centipede by Atari. The Dreamcast version was released exclusively in North America. The game is presented entirely in 3D, and has the player complete various missions involving the destruction of giant centipedes (and other insects). Unlike the original arcade game, the player has full control over his/her ship, and can therefore fire in any direction (and manipulate the camera while doing so) with powerups allowing the ship to be upgraded. There is also a classic mode which plays more similarly to the arcade game. The game was not well received by critics, and unlike the PC and PlayStation versions of the game, the Dreamcast port does not feature in-game music.